Am I using weird acronyms and phrases? It happens a lot in the LEGO® fan world. Some of these are explanations of nicknames from the community, some are the lesser-known names and nicknames from The LEGO Group itself... and some are quite simply just my own inventions! One of the perks of having your own blog I guess. Regarding the dual names of colours in my posts. [BL] refers to the name created by the fan community as used by the website BrickLink, and [TLG] refers to the official name used by The Lego Group. Where BL and TLG use the same name I make no annotation. By the way, LEGO designers use neither of these! They use the Color ID number, which you can find on this useful colours spreadsheet by Ryan Howerter. And as for those confusing piece numbering systems I include - see Element ID and Design ID. TFOLs (Teen Fans of LEGO) are another distinct group of people who fall outside The LEGO Group's main focus since probably most kids stop playing with LEGO in their teens. Some people just say FOLs, to encompass both teens and adults, but I'm not in the habit, so TFOLs can certainly consider themselves included when I say AFOLs! I accidentally christened the 1x1 round plate with hole (Design ID 85861) with this name after mishearing LEGO® designer Jamie Berard say "a hollow stud". Although I corrected the article, the nickname seems to have stuck and I still see it used elsewhere! This part is also known in the UK as the Polo, after the confectionery. Bluish Grey, known as Stone Grey within TLG. In 2004, they changed the shade of light and dark grey to be a little bluish instead of greenish. They did it in all innocence never imagining anyone would care or even notice... but there was a massive outcry from the AFOL community! 'Bley' was a derogatory term they coined and it has stuck, though perhaps now used with more affection with the fullness of time. The Character and Creature Building System. A system for creating action figures which TLG formalised in 2011. The usual system for building with LEGO® elements involves studs and tubes, but at the heart of CCBS are the large Technic ball and C-cup connectors. 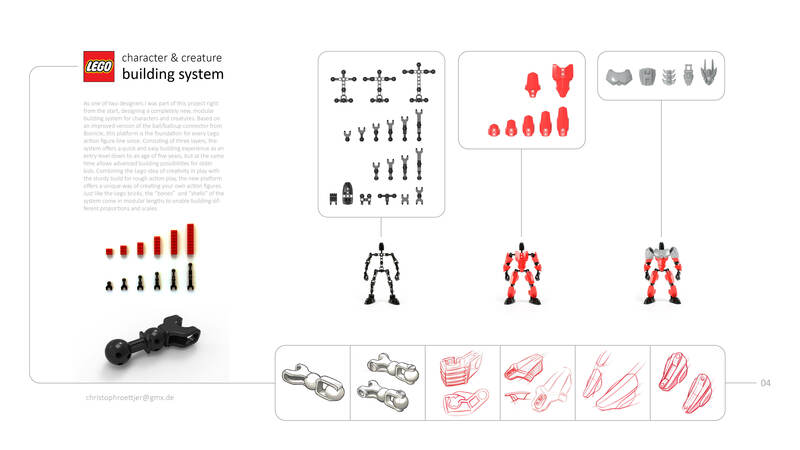 One of its designers, Christoph Röttjer, explains it succinctly in his CCBS diagram and one of our regular contributors, Scott Barnick, goes into more detail about CCBS in this post about the return of Bionicle. 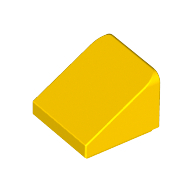 An easier name for this popular tiny slope than its official name, Roof Tile 1X1X2/3. I'll let you draw your own conclusions as to how it got this name. TLG's internal name for the building method used for buildable figure ranges such as BIONICLE and HERO Factory. See CCBS above. The set that brought an adult out of their Dark Age, making them an AFOL. Part 4733, a SNOT brick that's like the regular 1X1 brick but with hollow studs on all four sides as well as the top . It is a greatly-loved part amongst AFOLs and has many nicknames; I think most the common one is the Travis brick but I prefer this British nickname given due to its vague resemblance to the Daleks, an alien monster from Doctor Who. The period between when you stopped building with LEGO® toys as a child and then started again. The LEGO® Group assign a reference number to each different part. You can find them somewhere on the underside of every LEGO piece (except old ones; they started doing this around 1985). These are called the Design ID, but in the community they are usually just called the part number. You can use them to search on Brickset, Brick Owl, BrickLink and the LEGO Pick A Brick and Replacement Parts sites. See also Element ID below. A department of TLG in Billund who are the 'custodians' of the System. They ensure the features of parts are standardised across the whole inventory and that the suitable principles of LEGO building are maintained. The full details of these principles are largely a guarded trade secret but perhaps the most important principles that we mere mortals know of are not to allow connections that place stress on parts (known as illegal connections) and to enable stable building experiences from the ground upwards (literally). Children unknowingly flaunt these principles of course, whereas AFOLs do it knowingly and often gleefully. Both children and adults cry when their model falls to bits because they didn't follow the principles. Lesson: Trust the System. The System is your friend. As well as every part having a number, The LEGO® Group also assign a reference number to each different element. I define an element as being unique in colour as well as shape, so there are squintillions of elements! You can find them in every LEGO instruction manual (except old ones) at the end where the inventory is listed. These are called the Element ID, but the term is not used much (or understood well) outside of TLG. Nevertheless you can use them to search on Brickset, Brick Owl, BrickLink and the LEGO Pick a Brick and Replacement Parts sites. See also Design ID above. The official name for each unique LEGO® part. An element is not just the shape of the part but also the colour; so two identically shaped parts in different colours are considered different elements. Also known as the headlight brick or washing machine, this is one of the most beloved SNOT bricks around thanks to the many unusual aspects to its geometry and the anti-stud hole on its back side. It was designed in 1979 by a chap called Erling Dideriksen. Greebling is a term used primarily in the sci-fi movie industry to refer to the little bits of stuff applied to the exterior of a spaceship to make it look cool. The term can be used more widely than that though - Wikipedia defines it as "fine detailing added to the surface of a larger object that makes it appear more complex, and therefore more visually interesting" - but in the FOL world, spaceships are probably the most common type of MOC where greebles are used. One of the great joys of building with LEGO® elements is connecting the pieces in ways that set instructions wouldn't suggest. We've all stuck a plate between the studs of a brick, right? Actually, even LEGO designers used to do that one decades ago. But this is an example of what The LEGO Group now term illegal connections, because it places stress on the elements (however minute) and/or is an unstable method of building. These connections are not entirely known outside of TLG but this (now a little old but still very relevant) presentation by Designer Jamie Berard explains many. Children, TFOLs and AFOLs alike are terribly disrespectful of such LEGO 'laws', as we are not a responsible toy company. As such we flagrantly enjoy disobeying them and even boast of illegal connections we've discovered. Then cry when we knock the model lightly and it shatters into a thousand elements. LEGO User Group. Fan clubs around the globe are known as LUGs and the ones officially supported by The LEGO Group are RLUGs (Recognized LEGO® User Groups). Fan organisations that are not clubs, like magazines and websites (such as New Elementary!) are called RLFM - Recognized LEGO® Fan Media or RLOC - Recognized LEGO® Online Communities. Each RLUG and RFLM has an Ambassador who communicates with the community engagement department of TLG. Find your nearest RLUG and other great resources on the LEGO Ambassador Network website. One of the remarkable things TLG do for fans is offer them bulk parts at a bargain price. This occurs annually through the LUGbulk programme, and you need to be a member of a LUG to participate. It's called bulk for a reason - elements must be ordered in batches of 50 minimum, and there is a hefty minimum spend required in order for a LUG to qualify. Also, it takes a really really long time to receive your parts because these requests need to be fulfilled when the factory is not madly busy making regular sets for sale. Nevertheless it's an amazing way for fans to be able to build huge models - in the long term! LEGO® Minifigures. The little LEGO people, introduced in the 1970s. Initially they had no posable arms or legs and no facial expressions, but that was soon changed to the bendy little folk we know and love today. Something built in 'minifig scale' means all the buildings, cars etc are built at the same scale to a minifig. The human:minifig ratio is very vague due to the strange shape of minifigs, so two minifig scale models might not match. It is about 1:40 to 1:50. My Own Creation. A model built by a fan. As with so many words in English the noun has transmogrified into a verb, so "MOCing" means building your own creation. This is a series of sets from the LEGO® Creator Expert theme aimed primarily at adult builders and collectors, each consisting of a large building with removable storeys. The buildings all connect to build a street in minifig scale. One building has been released each year since 2007, when designer (and AFOL) Jamie Berard began the series. They are beloved by AFOLs thanks to their size, exclusivity, interesting and challenging building techniques, and of course rare parts. The name Modulars comes from the fact that you can add extra storeys to your building by buying more pieces to replicate floors. A set which some also consider a Modular is 10190 Market Street which was designed by Dutch AFOL Eric Brok and released by TLG in 2007. Also available is a set of the first five Modular buildings in microscale - 10230 Mini Modulars, also designed by Jamie Berard. The huge moulds which LEGO® inject molten plastic into to create elements. They are incredibly sophisticated and expensive lumps of metal! Sometimes by extension, AFOLs refer to parts as moulds, e.g. "is that a new mould?" Neo Classic Space. A fan building style heavily based on the 'Classic' period of Space sets, which TLG produced from 1979 to 1987. Learn more at Neo Classic Space. Nice Part Usage. A compliment employed by peers when a builder uses a part in a surprising, novel, unexpected way. AFOL Tim Gambort defined it well, with pictures, on Brothers Brick, and then there was some funny comments scrapping. These are the small models that come in little plastic bags. They're often for promotional purposes and not released globally, which is a carrot on a stick to certain collectors! Parts Out of Other Parts. A poor acronym but given it's a bit naughty, it's popular. It refers to those parts that cause strong emotions in AFOLs because they could be built from several smaller parts, which is taken as evidence of dumbing-down of the System. Usually referenced during discussions that begin, "when I were a lad..."
Elements with printing on them. An internal production designation within TLG that is given to all LEGO® elements that are out of production. This just means they are not being produced at this moment and you can't get replacements officially from TLG, not that they are necessarily concepts, rare or permanently retired, despite a lot of fans using the term to describe rare elements which were never available through a LEGO set or other retail channels. An AFOL nickname for 2x4 Bricks that is so friendly and natural it stuck immediately for many. It's possibly not widely used outside of the UK, given that it is quasi-Cockney rhyming slang. Back in the 1960s on east London street markets where LEGO construction was a popular way of filling in downtime for market traders, you could hear banter such as "pass us a two-by-foury guv, I'm making some apples today". The name soon mutated into 'rory' but never made the usual linguistic development of the rhyming word being dropped altogether in favour of another word in a rhyming phrase, although there were isolated incidents of the bricks being named 'Bremners' in the early 2000s. If you'd like to read more about this, you'll need to write your own porkies. Studs Not On Top. Many elements have the little building studs on the sides of bricks. This enables 'sideways building' (as TLG prefer to call it) at 90° but there are many methods of building at 180° also. SNOT technique is perhaps to be considered the cornerstone of adult fan building, allowing exciting new possibilities and finer detailing. STicker Across Multiple Parts. Another terrible acronym. Instructing stickers to be applied over multiple parts can be a particularly disliked practice as it makes the parts impossible to separate and use again. TLG seem to get that STAMPs are not very popular so include them less in sets nowadays, but they do still crop up, generally only in 'display' type sets. Today the word System refers to groups of elements that are designed to connect together. There is more than one System; for example Technic elements are a separate System (even though many elements can also connect to the main System). The word derives from the term System i Leg (System in Play, or System of Play); a concept developed by Godtfred Kirk Christiansen in the mid-1950s that transformed the company. It focused their attention on the interlocking brick and how that could form the basis of an infinite range of compatible toy products. A great summary can be read at Brick Fetish. Those little builds that are just to explore an idea, even if it doesn't go anywhere. Usually accompanied by the thought, "that's cool. I must use that in a MOC..."
The Technic System of elements was introduced in 1977 and still runs successfully today. It consists of parts like gears, axles, pins etc. enabling functional mechanical models to be built. It is not 100% compatible with regular System parts. The LEGO® Group. Their official company name. Widow/Widower of Adult Fan of LEGO. Pronounced as in 'woeful'. The long-suffering partner that accepts, to varying degrees, that there are three people in their relationship... well, two people and a bunch of plastic. Great collection of points. loved reading through it. Oh glad you enjoyed it - I wondered if a Glossary was worthwhile considering many sites already have them. I'm adding to it as I write posts. Tragic story! I love thinking back to all the LEGO fights I had with my sister. I'm glad yours has a happy ending! Don't forget TFOL. (Teen Fan Of Lego) Hardly worth mentioning, but FYI. TFOLs are often underestimated, IMHO. Some are top notch builders, and that is despite the fact that they most likely have lots less parts than AFOLs: https://www.flickr.com/photos/josdu/ https://www.flickr.com/photos/graham-gidman/ and https://www.flickr.com/photos/130093880@N02 just to point out a few. Clonie or clone, a clone brand i.e.mega bloks etc. I call Megablocks, Kreo, etc "FLEGO" for Fake LEGO. I don't know how often you update the glossary (not very often, I imagine), but is it possible to receive notifications when this happens? Not that I know of. The Blogger template doesn't seem to offer it. Very kind :O) but don't worry too much about missing new glossary entries; they generally only happen when I mention a new thing in a blog post, so you should catch them all that way seeing as you're a faithful reader! Technic was called Technical Lego when it was introduced. Seems like Technic became an international label in 1984. I think this is relevant because pieces from the CCBS are increasingly turning up in System themes like Legends of Chima. Just calling them Hero Factory pieces could be a bit misleading since there exist some like the new torso shell from this year's Legends of Chima constraction sets that are never used in the Hero Factory theme. Tim, is it worth considering adding Toilet seat tiles to the Glossary? I also like the term Laundrette for the 1x4 brick with side studs.